Getting your garden borders right is essential for a beautiful and well-maintained garden. Think of borders as both decorative and architectural elements in your garden – not only do they fill your outdoor space with colour and fragrance, but they are essential for zoning different areas, improving privacy, and pulling the design together into a cohesive scheme. Whether you like a landscaped, formal look, or would like to create a natural garden, follow these tips from the horticulturalist Matt James and create luscious, thriving garden borders. Then, get more practical tips on how to plan, design and cost your garden transformation. Working in harmony with your garden is always best. Plants grown where they’re happiest need little attention and both flower and fruit better. Spend time noting the characteristics of beds and borders: are they sunny or shady? Wet or dry? Sheltered or exposed? Chances are you’ll find different growing conditions in different parts of the garden. Look carefully, and then choose appropriate plants to match each one. All good gardeners make their mistakes on paper, not on the ground, saving both time and money in the process. Use graph paper and draw on the outline of the area to be planted, preferably to scale (1cm on paper to 50cm on the ground –1:50 scale – is ideal for all but the most complicated schemes). Then, considering the scale you’ve selected, play with different arrangements until you find one that works. Plot plants with their mature size in mind to be sure they’ll fit. Find combinations you like on our gardens hub page, look in books and magazines, and if growing conditions are the same as those in your garden, copy them. Neighbouring gardens and labelled displays at nurseries and garden centres are also useful for ideas. How much time do you have? For young families and those at work all day, winter and summer bedding, rose bushes, fruit, vegetables and floppy perennials are too time-consuming. Instead, favour shrubs, tidy conifers, ornamental grasses and tough-but-colourful mat-forming perennials such as Stachys Byzantina ‘Silver Carpet’. All need little attention once established and suffer few pests or diseases. Find out more about what's involved in our garden maintenance checklist. Picking a theme brings clarity and focus to the design process. Personal taste and how you plan to use the garden have an influence, but the space itself can offer clues as to what works best. For example, a sunny free-draining slope is perfect for an informal Mediterranean-inspired gravel garden. Visually, it won’t look out of place either. Hold yourself back from including every plant on your shortlist, as the planting will look chaotic and unplanned. Aim to create a sense of harmony and unity by choosing a colour palette or theme early on. Repetition is the easiest way to unify a planting scheme. It’s also the one thing that marks out a ‘designed’ border from one that happens by accident. Perhaps use the same hedging throughout or repeat evergreen perennials or ornamental grasses in drifts at the front of beds and borders (where repetition is most obvious). While harmony is important, so is diversity. Plants with distinctive colours and dramatic shapes, such as spiky palms and pencil junipers, make great focal points. But a little goes a long way, so use sparingly or the planting will look over-stimulating. With standard-sized borders (1.5-2m wide) one focal point plant every four to six metres should be enough. Learn about choosing plants for your garden. Colour is a personal preference, but if you want to be more precise about it and create memorable plantings like the professionals, choose a classic combination, taking into account the colour wheel. Colours opposite each other complement through dramatic contrast. Those adjacent are harmonious and the easiest way to combine colour over a large area. You could pick the shades, tints and tones of one colour only for a sophisticated monochromatic look. Or alternatively, choose an exciting triadic combination using three colours from the wheel, each spaced equidistantly apart. A multicoloured scheme is also a possibility, but isn’t that easy to pull off successfully. Find out how to choose a colour scheme for your garden. And... discover how to use a colour wheel for interior design and colour scheming. The easiest and most visually effective way to arrange plants is in layers, with borders backed by walls or fences, tall shrubs, bamboo and lofty grasses first. Place roses, smaller shrubs, mid-sized perennials and ornamental grasses in the middle. Feature shorter shrubs, mounding perennials and ankle-high ground-cover plants in front. However, try to avoid arranging everything like a series of steps. On occasion sweep low plantings towards the back, and taller ones to the front, to create depth and interest. Thin strips under 50cm wide will only allow for a low hedge, a wall shrub, or a line of tidy perennials arranged uncomfortably like soldiers on parade. Beds and borders in excess of two metres, however, can accommodate multi-layered mixed plantings with shrubs, roses and more natural drifts of perennials and grasses. Some designs, naturalistic ‘prairie-like’ plantings in particular, need lots of space for the effect to be appreciated. In small gardens this might mean sacrificing lawn space. In urban and suburban gardens, continuity of interest is important. The mixed border is best, as you can call on every plant group – trees, shrubs, roses, perennials, and bulbs – for interest, with each group sparkling at different times of the year. Plants with fiery autumn leaves, stunning seed heads, colourful fruits and berries, brilliant bark or evergreen leaves prolong seasonal interest and help to lift the spirits on drab days. Find the best plants for a colourful autumn garden and how to plan a beautiful winter garden in our guides. The shape of plants is just as important as flower colour and because it’s around for much longer (with woody plants, all year round), shape helps to structure the planting. The colour and texture will then supply the finish. Brilliant for seasonal interest in spring, summer and autumn, most bulbs cope with competition so can be planted to grow through frothy perennials, giving you two colour bursts from the same place – ideal where space is tight. Only large-flowered tulips need replacing each year. Offering year-round interest for little effort, shrubs bring all-important ‘body’ to your borders, too. 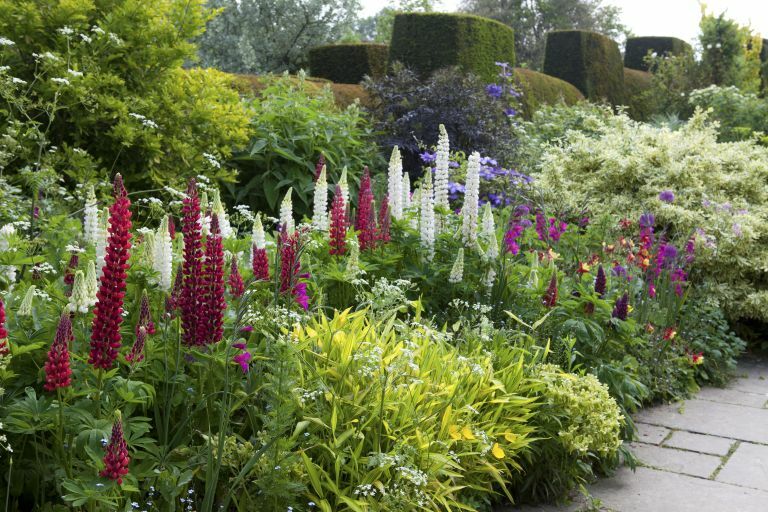 As a guide, most mixed plantings should contain at least 40 per cent, spaced evenly throughout the display, from the back right down to the front. Evergreens with good form and shapely leaves should be first choice, especially in small spaces. Consider size at maturity and vigour carefully, though, as some shrubs can grow to monstrous proportions. If big plants are your thing, explore how to make an impact with mature plants. Plant plenty of ground-cover perennials and mat-forming shrubs to smother the soil and keep down weeds. But, don’t cram plants in cheek-by-jowl for an instant effect. Observe the correct spacing (your garden centre or nursery will help here), or be prepared to undertake some judicious pruning in a few years’ time. Never place each plant as a solitary specimen. This results in a bitty-looking display. Instead, plant in groups proportionate to the size of space. In small gardens/borders, shrubs and roses planted in groups of three is common, unless they’re larger specimens, where one by itself is fine. For perennials and grasses, plant in groups of three to 12 plants, depending on the importance of the plant and how distinctive it is; some plants – particularly pastel-coloured single-stemmed perennials, for example – are invisible by themselves. Height is important for interest, contrast and to pull the eye skyward. Fastigiate (pencil-like) shrubs and climbers trained on wigwams are ideal. Take full advantage of walls and fences, too, perhaps combining tidy non-invasive climbers that flower at different times to prolong the season of interest. Roses and large-flowered summer clematis is a classic combination. Use our guide to growing a vertical garden for more design advice and find out how to create a rose garden. Scented plants enliven any garden, so try to include them when possible. There are so many different ones to choose from, but how powerful the perfume is will determine where they work best. ‘Free scents’, such as from Dutch honeysuckle and white jasmine, perfume the air for yards and are generous, sometimes to a fault. ‘Up close and personal’ scents, such as from roses, witch hazel and Daphne, are more subtle, so position near areas you use the most. ‘Touchy-feely’ scents, such as from thyme, are released only when the plant’s leaves are picked; position in patio pots or next to paths, within easy reach.